The clients wished for a serene space in their Chestnut Hill home that they could begin and end their hectic days in. Tapping into the outdoor showers of The Cape, where they also own a home, we decided to bring some teak into the wet area, accompanied by a skylight to catch the morning light for an "outdoor feel" inside of the suburbs. The shower deck is supported by a product that is marketed for roof deck systems. It allows the deck to be to removed to clean beneath it periodically, and to eventually be replaced after the marine grade varnish that protects the teak begins to wear. 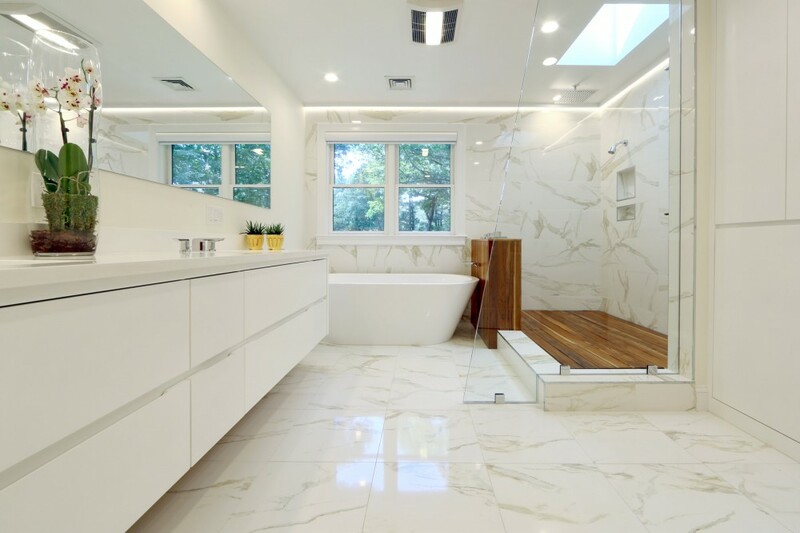 The tile is large format porcelain faux calacatta gold. The extremely long vanity and the linen closet were custom built for this space, and the wall and trim color were chosen to match the white of the furniture, so that the tile and the teak would be the only color remaining in the room. The Toto Soiree widespread lav faucet was chosen, to accentuate the length of the vanity, and the clean lines of the Hansgrohe Axor Starck controls on the knee wall were selected to playoff of the grain of the teak. The mirror wraps the corner and overshoots the already extended vanity, so that even though the amount of teak is minimal, one is aware of it no matter their place in the room.